Layaway plans are becoming more popular again but they were common place years ago. The idea began during the Great Depression when retailers offered cash-strapped consumers the option of shopping by paying for something a little at a time. If you couldn’t afford to buy an item outright, the store would allow you to put it on hold with a small down payment. You would continue to make periodic payments until the item was paid off and you could take it home. When credit card shopping became popular during the 80’s and 90’s, most stores discontinued their layaway plans and increased their profit margins by promoting credit cards branded for the store. Layaway was largely forgotten. However, since the economic downturn, many people are once more reluctant spenders, so some retailers have resumed their layaway programs in an effort to get more customers to shop. Some retailers even offer online layaway plans. A layaway plan allows shoppers to make a purchase without having the full amount of money immediately available for the items they want. A small deposit will hold an item for a period of time, which varies from store to store. Sixty days is the average. Some retailers extend that time period during the peak holiday shopping season. After something has been put on layaway, the purchaser makes regular payments until the item has been paid for in full, at which time they can take it home or have it delivered. Layaway is a convenient way to pay for large ticket items like furniture but virtually anything a store sells can be held for you. This method of shopping can be beneficial to both the store and the customer, however their are drawbacks as well. Unlike credit cards, a layaway plan doesn’t involve charging interest on the balance owing. A good credit score isn’t required in order to participate. There is no risk that an item will be gone or sold out by the time you’ve saved enough money to buy it. You’re not adding to credit card debt. It’s easy to forget the daily charges that keep adding up when you buy on credit. A layaway plan is a good budgeting tool as regular payments must be made in order to acquire the desired merchandise. Not every item in a store is available for layaway. Computers, food and liquids may not be available through layaway. Some stores charge a small fee in addition to a down payment to put something on layaway and may hit you with other fees if you miss a payment. A service charge or a restocking fee may apply if you change your mind about buying the item. If the store offering layaway should go bankrupt, it will leave you in a difficult position if you can’t afford to pay off the balance right away. It’s best to deal only with established stores like Sears that aren’t likely to go bankrupt. A bankrupt store may hold both your items and your payments. How much time do you have to pay off the balance? Can you get a refund if you decide you no longer want the item? If the item goes on sale after you’ve put it on layaway, will the store adjust the amount you owe? What, if any, service fees are involved? Be sure to keep all receipts. Layaway shopping has become more popular as a way to budget for the holidays, as long as you understand the store’s policies and are prepared to make regular payments. Layaway plans can help you to become more budget-conscious and reduce costly credit card interest charges. 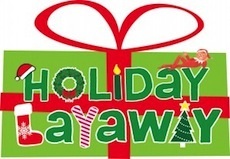 I really like the idea of layaway, especially during the holidays when a lot of people charge gifts. It’s a great alternative to avoiding debt.